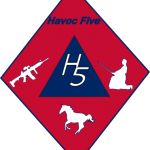 While Havoc 5 focuses primarily on our family activity in the shooting sports, we do have a very diverse range of interests and hobbies. Recently we opened up an Athlete page over on Facebook for Daughter Number One. Between this H5 site and facebook you are likely to see a broader variety of content. Please be sure to head on over to facebook and follow the adventures there as well.